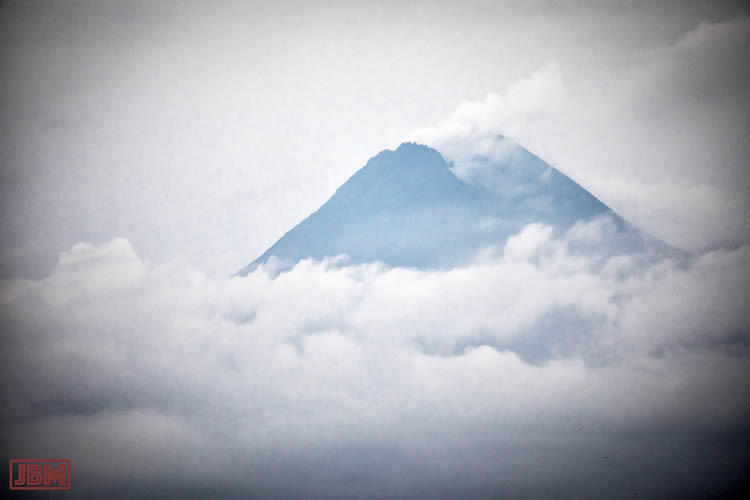 Our drive up there skirted around several volcanoes, including Merapi and and Merbabu. 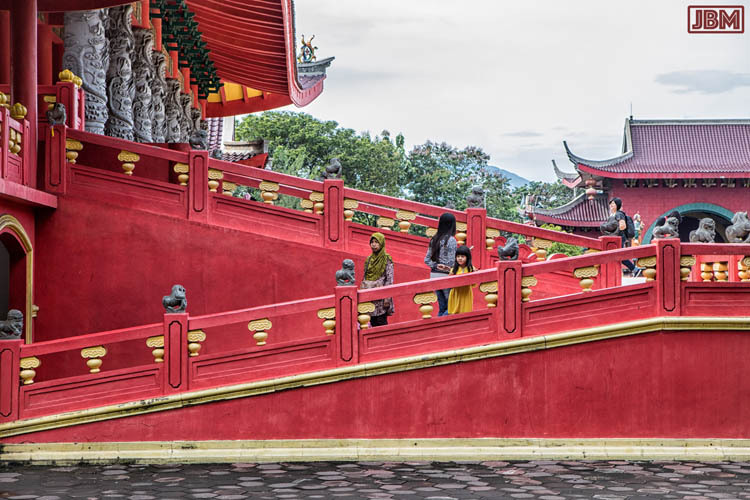 There is a sizeable Chinese Indonesian community in Semarang, and a number of examples of Chinese architecture, and not just in the ‘Chinatown’ area of town. 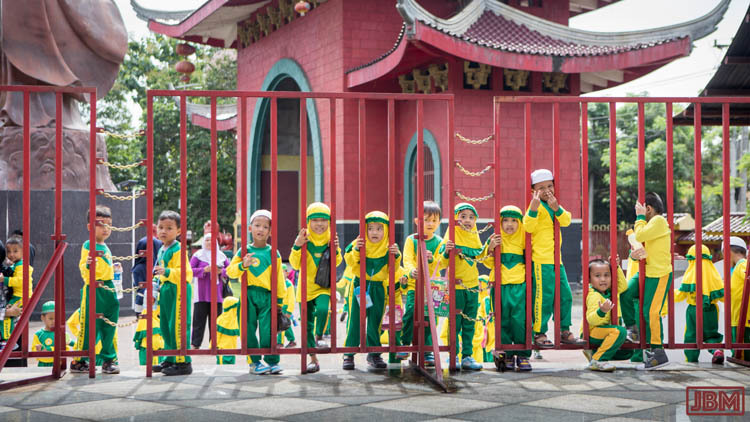 The Sam Poo Kong temple dates back to the beginning of the 15th Century CE, when the Chinese Muslim explorer Admiral Zheng He visited the area. He (He) prayed in a little cave, and a small temple was established on the location. 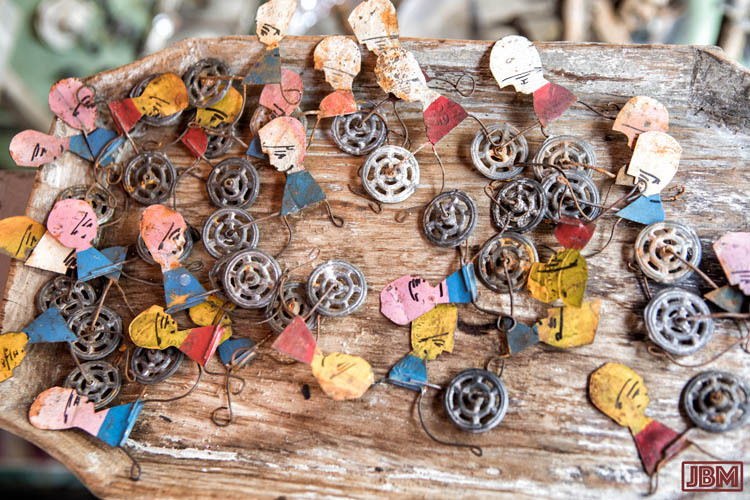 It is now a site used by people of various faiths – Confucian, Muslim, Buddhist and Hindu, while retaining a very Chinese feel to the architecture and artworks. Over the centuries it has endured many cycles of neglect and renovation, and was restored to its present impressive condition just ten years ago. 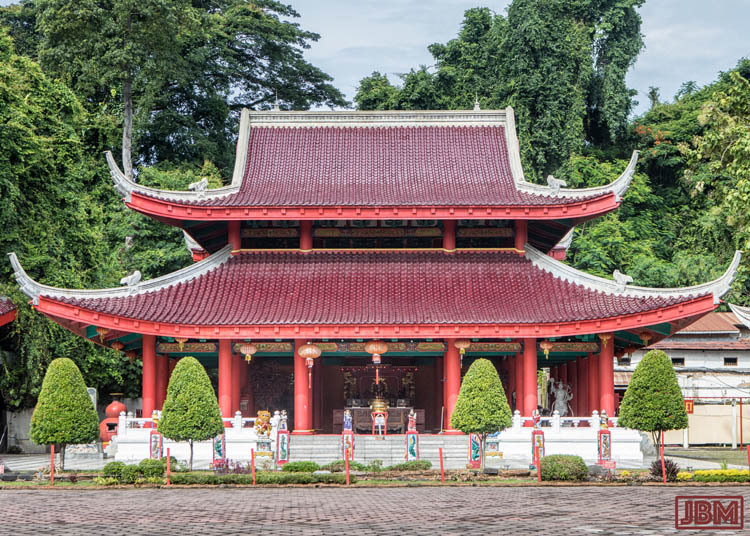 The Tho Tee Kong temple (also called Dewa Bumi) is used by people praying to the earth god Tu Di Gong – who will “provide fertile soil, abundant harvest and a wealth of natural resource diversity”. 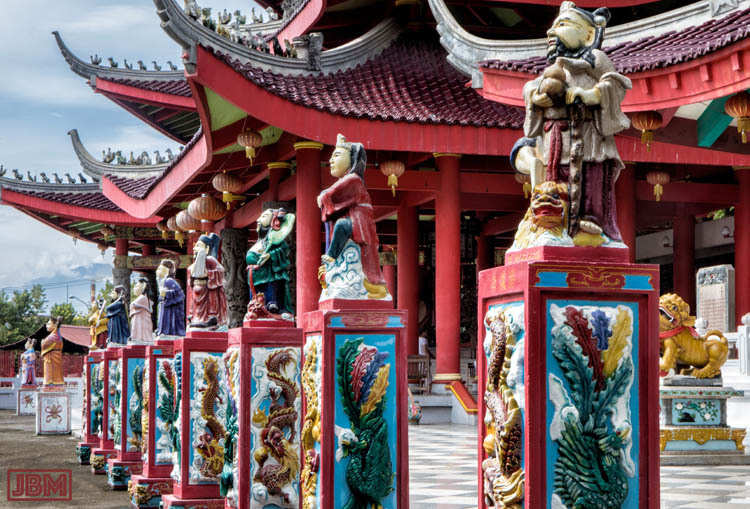 The temples (klenteng) have all been built around a central paved square. One one side is a large stage area, used for all kinds of performances and ceremonies. While we were there, a large team of young Danish gymnasts arrived to put on an acrobatic show for the bemused locals. We visited each of the temples on site, attracting some curious glances, and (as always) great interest from the children. When we arrived at the Klenteng Tay Kak Sie, preparations were under way for a ceremony to mark the seventh anniversary of the death of prominent member of the community. A model house, complete with cars, staff, air conditioners, satellite dish etc was constructed, all from paper, to be burnt later that day. 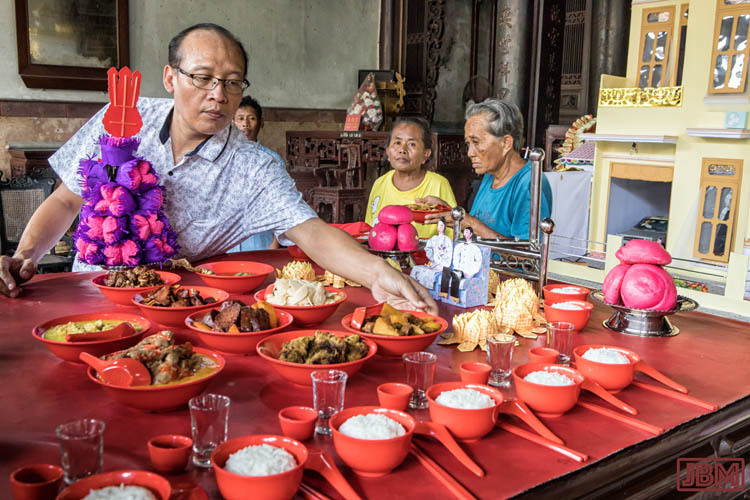 Meanwhile temple attendants prepared an elaborate meal for the spirits. 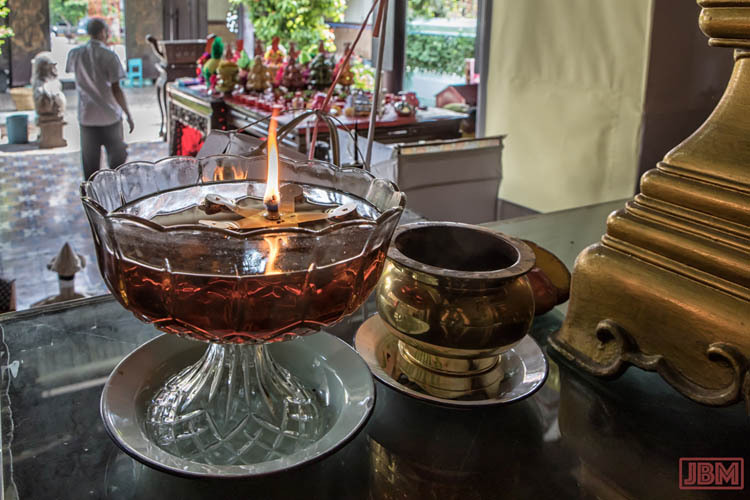 An oil flame candle burnt in a bowl beside the shrine. 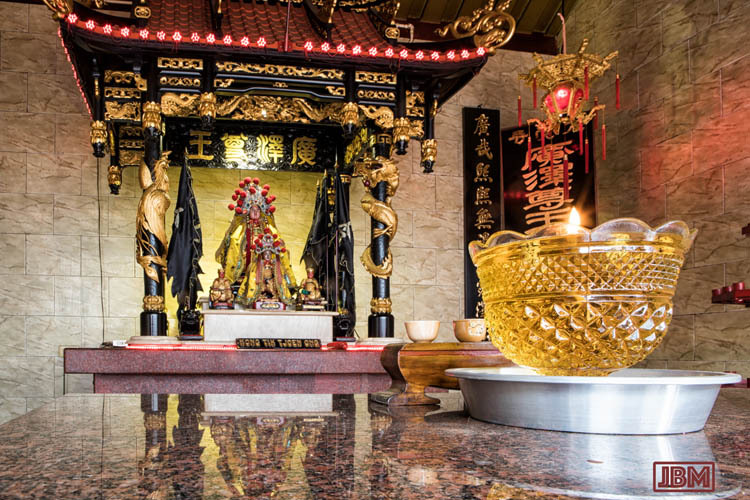 In another part of the temple are shrines for several bodhisattvas and guardian deities – this one to the ‘minor’ Taoist god Kong De Zun Wan (known in Hokkien as Kong Tik Djoen Ong). 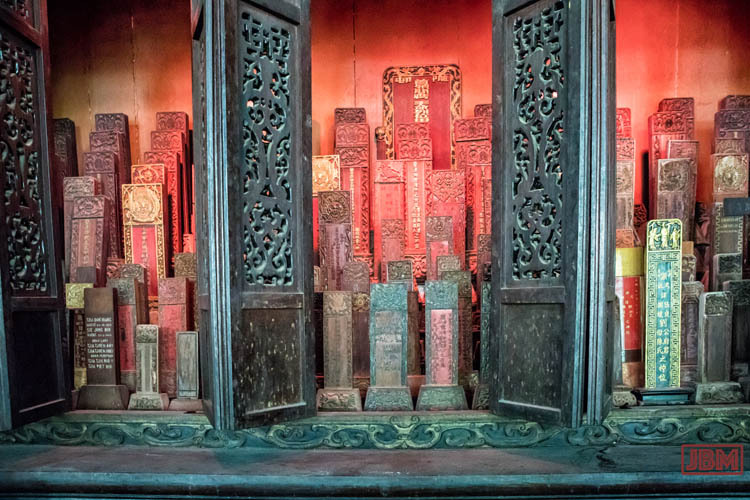 Displayed in alcoves along one wall are engraved tablets dedicated to the memory of prominent members of the community. Not far from the Klenteng Tay Kak Sie is Kota Tua, the old Dutch centre of town, with a number of fine (and not-so-fine) examples of colonial architecture. (The centre of town has long since moved to another area, which is less prone to flooding.) 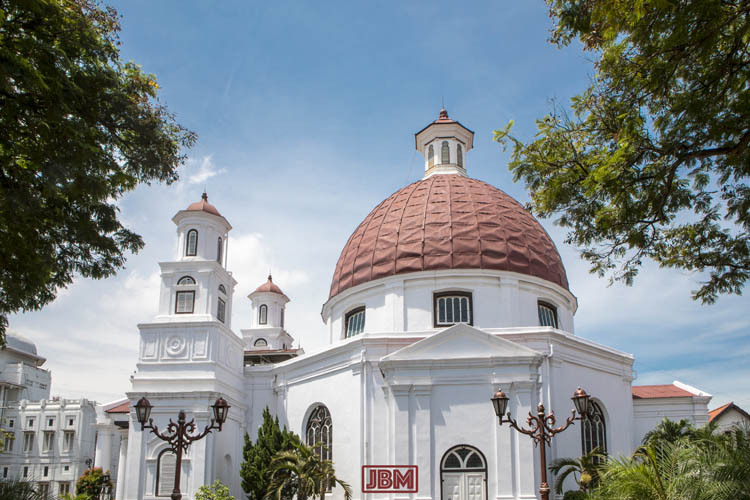 The Immanuel Protestant Church of Western Indonesia (generally known as Gereja Blenduk) was first built in 1753, and is the oldest church in Central Java. 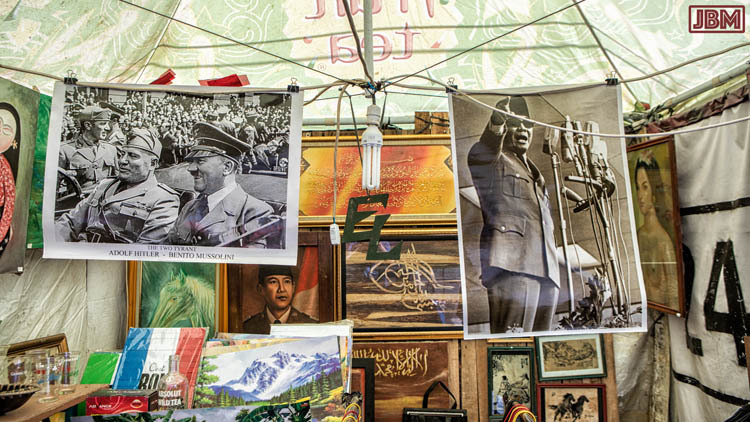 The owner of this stall seems to have made a point of hanging a printed photo of former President Suharto beside another of Hitler and Mussolini. 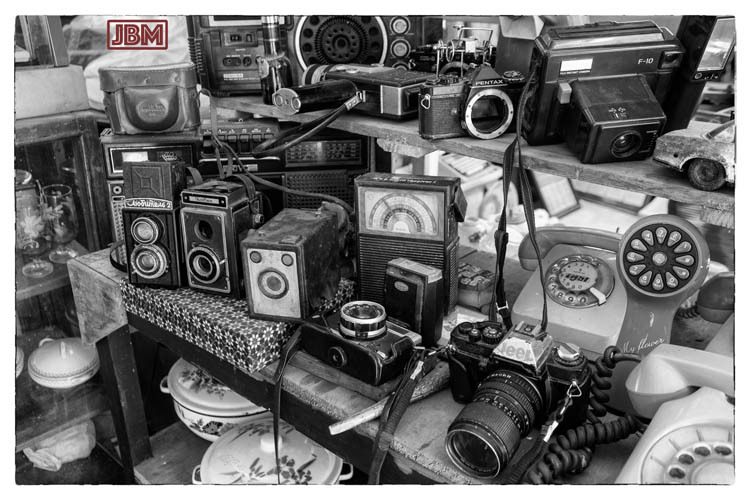 ‘Old Order’ and ‘New Order’? 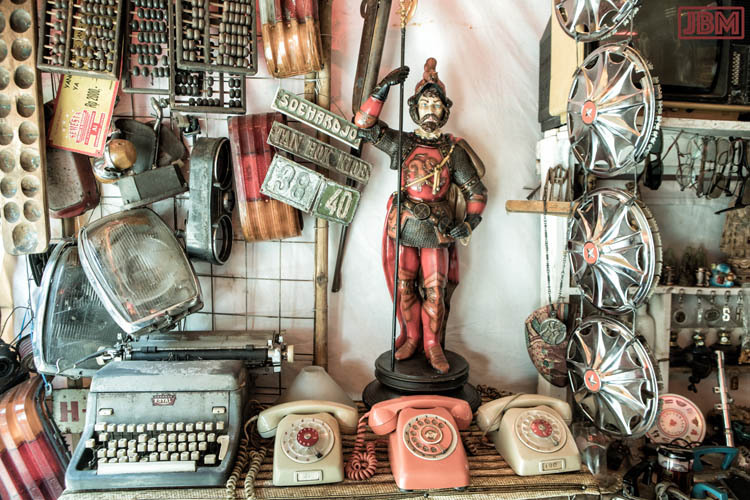 Another stall had a great mingling of European ceramics and Javanese statues and other artworks. The four figures above would be immediately identifiable to any local. 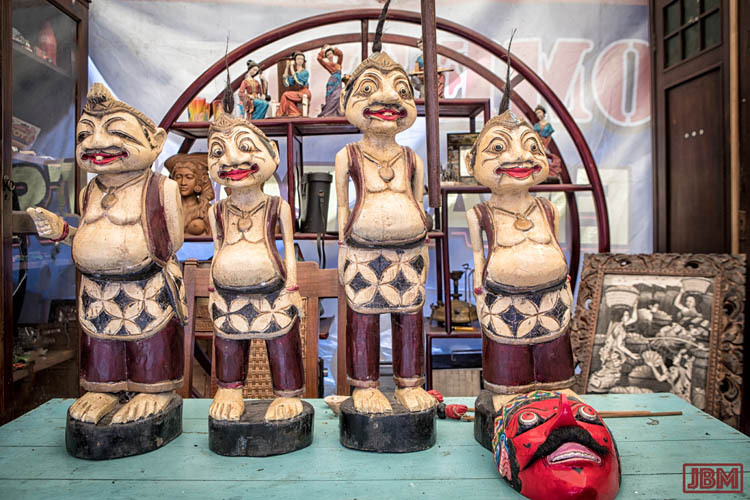 They are Semar, Gareng, Petruk and Bagong – the four Punakawans who are only found in the Indonesian version of the Mahabarata epic. 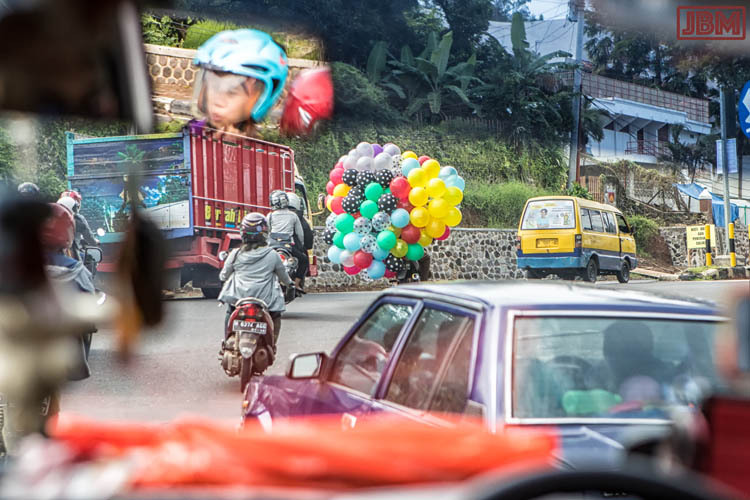 They appear clownlike, but they are themselves gods, and are deeply profound observers of human folly – especially Semar (on the left in the photo above) – who is the father of the others. After a rather nice seafood lunch at the local branch of the Rumah Makan Cianjur franchise we went to visit the Lawang Sewu. This compound of four elegant white colonial buildings is the former headquarters of the Dutch East Indies Railway Company. 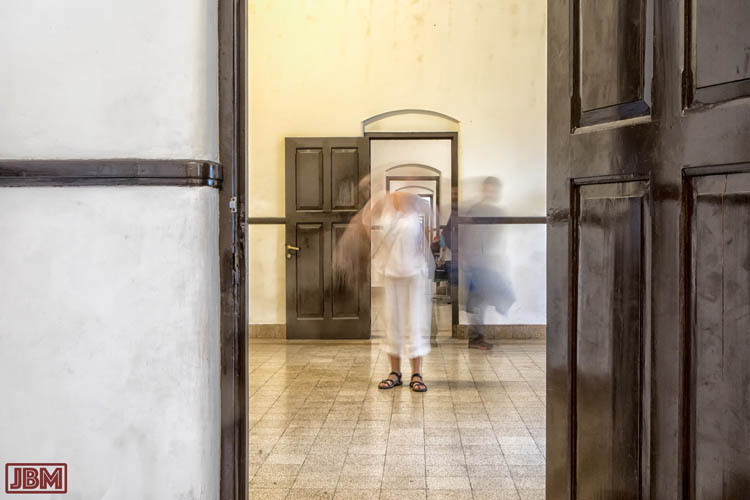 In the Javanese language, Lawang Sewu means “one thousand doors”, and there certainly are a LOT of them – though perhaps not quite 1,000! 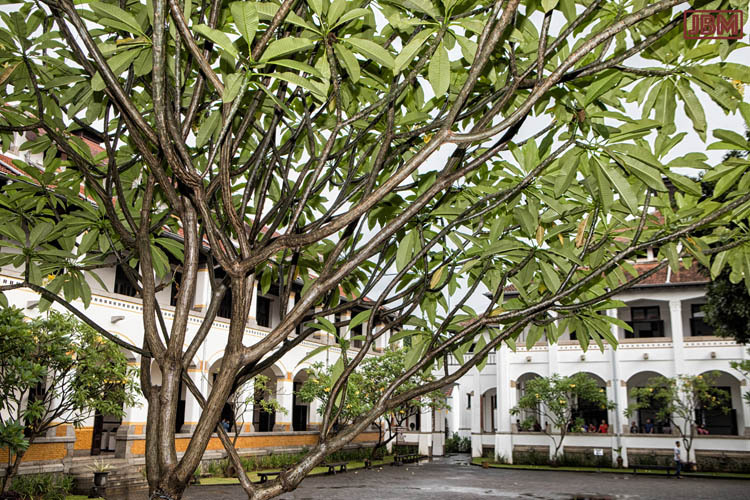 The central courtyard is adorned with frangipani trees and one huge and very old mango tree. Construction of the complex began in 1904, in an architectural style known as ‘New Indies’, apparently a version of Dutch Rationalism, transitional between 19th century classicist and the modernist styles of the early 20th century. 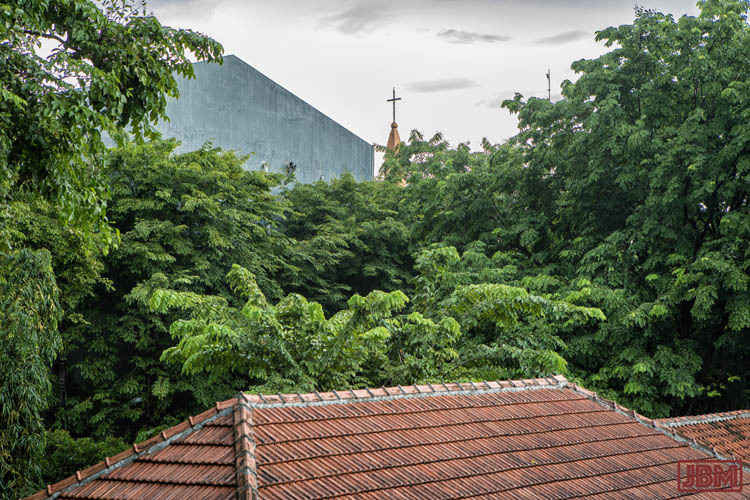 A nearby church spire viewed from the top of the Lawang Sewu. 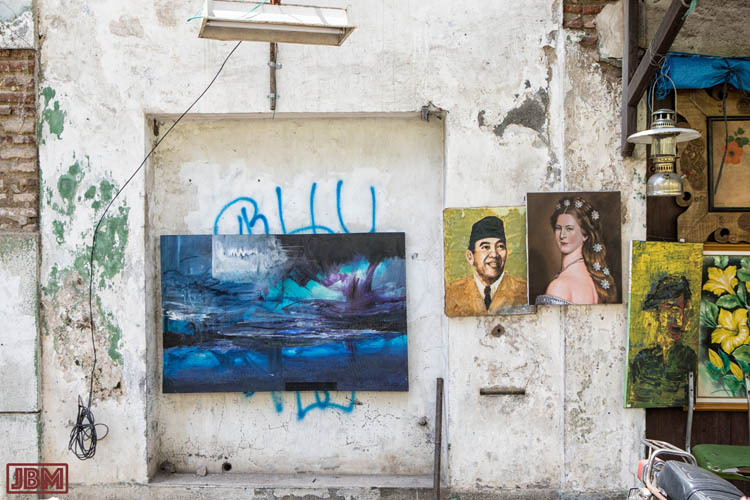 Along the lane of the Kota Tua ‘Antique Market’. 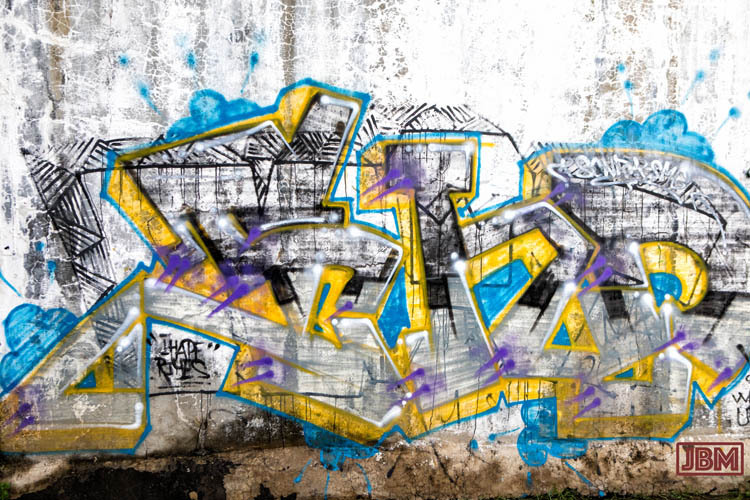 Street art on a wall near Lewang Sewu. This entry was posted in Indonesia and tagged Gereja Bleduk, Klenteng Tay Kak Sie, Kong Tik Djoen Ong, Lawang Sewu, Sam Poo Kong temple, Semarang, Tho Tee Kong temple. Bookmark the permalink.